An alumnus of the SUNY College of Environmental Science and Forestry (ESF) has won the United Kingdom's top nature conservation award for work he did with Mayan communities on a biosphere reserve on the Yucatan Peninsula. Gonzalo Merediz-Alonso, 36, a native of Mexico, received the Whitley Award sponsored by the musician Sting and his wife, actress Trudie Styler. Sting earned fame with the band The Police before he started a solo career in 1984. The couple helped found the Rainforest Foundation in 1989. The award carries a prize of 30,000 pounds, roughly equivalent to $55,000. Merediz-Alonso was one of nine award winners from around the world this year. No American has ever won the prize. Merediz-Alonso was recognized for his work with Mayan communities in Sian Ka?an Biosphere Reserve. The 1.6 million-acre reserve is a Caribbean paradise of coral reef, pristine wetlands and extraordinary tropical forests. It is one of Mexico's largest protected areas and is designated as a UNESCO World Heritage site. A high biodiversity of species, including jaguar, jabiru stork, tapir, manatee, crocodiles, sea turtles, howler monkeys and many species of coral, are found there. It is also the setting of the 2,000-year-old Mayan culture and 25 ancient Mayan ruins. Merediz-Alonso earned his master's degree from ESF in 1999. His thesis research, "Ecology, sustainable use by local people, and conservation of the Morelet's crocodile in the Sian Ka'an Biosphere Reserve," was supported by the U.S. Fish and Wildlife Service, and the North American Wetlands Conservation Council. This support also led to a major report in support of the Bala'an K'aax (Hidden Forest) reserve, which covers more than 300,000 acres and was formally established by the Mexican government in February. "He's just a great person," said Dr. Guy A. Baldassarre, who was Merediz-Alonso's major professor at ESF. "He is doing what our students study about. He's inside these communities in Mexico, making conservation happen." Merediz-Alonso has spent 12 years working with a local environmental organization, Amigos de Sian Ka'an (ASK), to develop collaboration strategies with the Maya to promote the sustainable use of natural resources. The Maya are learning to safeguard community resources and protect their ancestral lands through environmental stewardship, instead of leaving the reserve vulnerable to development by outsiders. By encouraging the use of traditional skills such as embroidery, furniture carving, medicinal plant use and honey making, Merediz-Alonso and his team are helping the Mayan culture survive while developing financial resources that do not harm the environment. The Whitley Award recognizes nature conservation projects that are community based. It is given to people whose work involves both human rights and the environment, treating each as inseparable from the other. 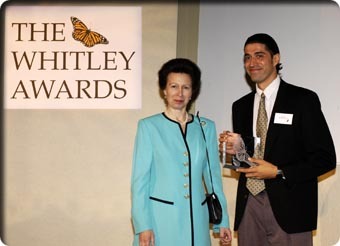 The Whitley Awards have been awarded annually by the Whitley Fund for Nature, based in the United Kingdom. It is one of the world's largest nature conservation awards program. The annual awards ceremony is hosted by Anne, the Princess Royal.